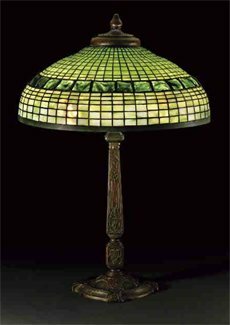 This is a good example of a 20 inch plain green glass, square geometric pattern shade with a "Turtle-Back" tile glass band. It is in the "dome" shape and is model #1487. The shade rests on a "Library" base named "Old English," model #557. Shade and base both signed.